Created by ceramic artist Paul Cummins, with setting by stage designer Tom Piper, 888,246 ceramic poppies will progressively fill the Tower’s famous moat over the summer until the final one is planted on 11th November 2014, Armistice Day. 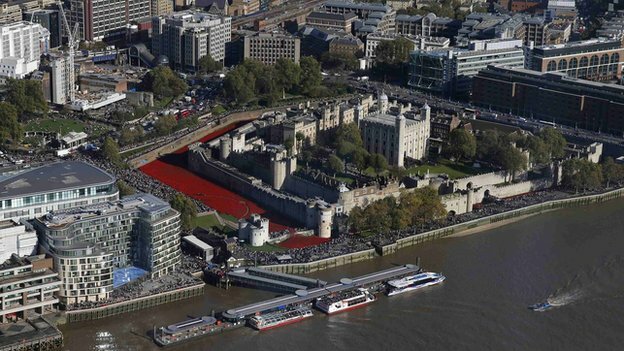 Each poppy represents a British military fatality during the war and marks the 100th Anniversary of the start of the First World War. From this line came the idea for 888,246 poppies, one for each British or Colonial military fatality during the First World War. Potters at Paul’s studio have been hand-making the pieces using techniques which were utilised by potters during the First World War. Tom Piper was born in London and studied biology and art history at Trinity College, Cambridge, and production design at the Slade School of Fine Art. He worked as an assistant to Chloé Obolensky before beginning his freelance career in theatre. He regularly collaborates with various directors including Michael Boyd and Sam Mendes. He has been associate designer for the Royal Shakespeare Company since 2004. Tom collaborated with the British Museum and Alan Farlie Architects on the exhibition Shakespeare: Staging the World in 2012 as part of the Cultural Olympiad. His many awards include an Olivier Award (costume design) for the Histories series.